The Royal Hotel Bamboo Sheets come highly recommended. They have a 4.2 star rating on Amazon, as well as hold a badge for "Amazon's Choice". It seems to be a pretty popular high quality bed set with a lot of great reviews. Even still, will it hold up to our expectations? With the lack of a company website, the only information we have to go on is the Amazon product page, so we will do our best. The Royal Hotel Bamboo Sheets are not a blend. They consist of 100 percent rayon from bamboo. Often called bamboo viscose, it makes up the majority of bamboo fabrics and the best bamboo sheets, on the market today. Most bamboo viscose is made using a specific rayon viscose process. This involves dissolving the bamboo cellulose in a strong solvent. This creates a pulpy solution that's forced through a spinneret and into another solvent that solidifies the cellulose strands into the fibers. These will then be used to make the thread and ultimately the rayon. Some of the chemicals companies use in the process of making rayon include chlorine bleach, sodium hydroxide, sulfuric acid, and carbon disulfide. Due to this, the rayon tends to not retain much of the original bamboo. In fact, bamboo rayon sheets are required to be labeled as Rayon made from bamboo. This is because, in 2009, the FTC (Federal Trade Commission) found that rayon made from bamboo really does not retain any of the antimicrobial properties of the bamboo plant. In addition, it's manufacture is absolutely not eco-friendly as the process results in a lot of wastewater, along with harsh and toxic chemicals. The size of these bamboo bed sheets is very generous. Looking at the king set specifically, it includes a flat sheet of 110 inches by 102 inches, a fitted sheet of 78 inches by 80 inches (that also fits up to an 18-inch deep mattress), and two pillow cases of 20 inches by 40 inches each each. The 18-inch deep pockets are very generous because many other bed sheets we have seen only are able to fit a 16-inch deep mattress. This means that it can easily fit on a mattress, even if you are using a mattress topper. You can also get them in a very wide array of colors. The basic is white, of course, but you can choose from 11 others including red, green, and blue. The Royal Hotel Bamboo Sheets actually have a few great features that come with them. For starters, they are really soft. 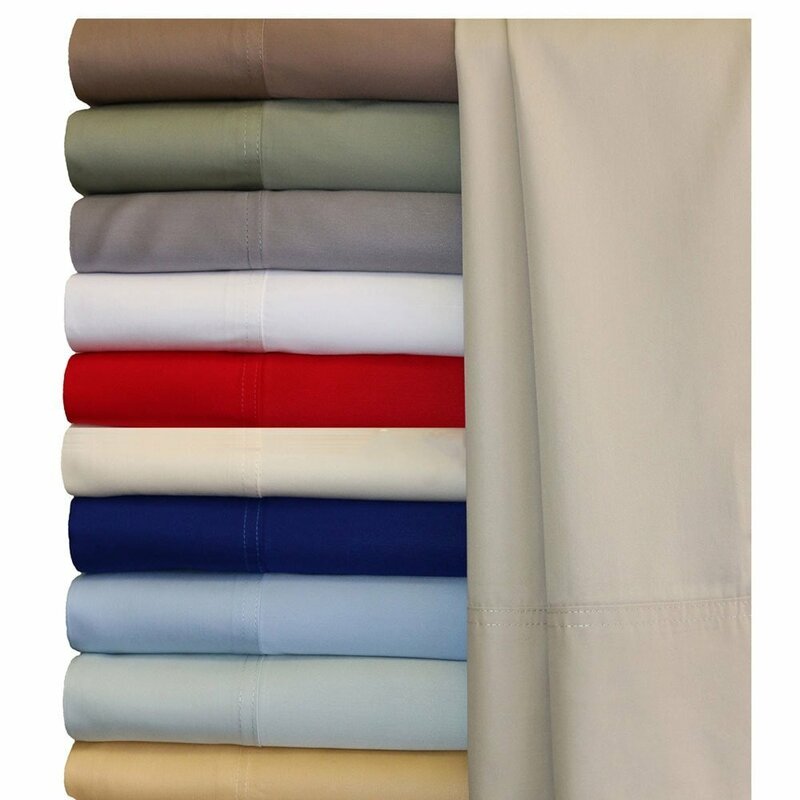 They have a 300 thread count, and the fact that they are made from Rayon means that they are already really soft. Now, while the Amazon page does say they are hypoallergenic, the general consensus about the beneficial properties of rayon is that rayon does not retain any of the hypoallergenic properties from the original bamboo plant. This is because of the chemical processing it goes through. The care that is required for these bamboo bed sheets is also very minimal. However, it does require a special washing. Don't worry, it’s not like hand wash and air dry or anything. But these bed sheets are machine washable in cold water only, on a delicate cycle, and with a mild detergent. You should then dry these bed sheets with a low heat cycle. The thing you need to pay attention to is that they need to be taken out of the wash immediately after they are done. Leaving them to soak can cause damage to the rayon. Unfortunately, there is no "About Us" section on their website, but their Amazon page seems to have nearly all positive reviews. Actually, all of their products seem to have positive reviews, and each of them seem to be made from a bamboo rayon. The Royal Hotel Bamboo Sheets are generously sized. This set of bed sheets contains four pieces in each set, including a flat sheet, fitted sheet, and two pillow cases. Uniquely, the fitted sheet has deep pockets that can fit a bed with a depth of up to 18 inches. If you are using a mattress topper, you will not have to worry about these bamboo bed sheets not fitting. The level of care required for these is low but still specific. They are machine washable, but you must wash them in cold water with a mild detergent, taken out immediately after the cycle is done, and dried on a low heat cycle. While the care level is specific, it is still fairly simple to follow. If you are looking to express yourself in a colorful way, then these are the bamboo bed sheets for you. You can choose from up to 12 different colors. Plus, these sheets are available for any sized bed from Twin XL to a split or California king. With a 300 thread count and being made with rayon, these bed sheets are very soft. Rayon is among the softest variation of bamboo fabric you can buy. Due to the process to make bamboo rayon sheets, the fabric is absolutely not eco-friendly. The use of various toxic chemicals and the amount of wastewater that is produced is fairly damaging to the environment. The rayon is also not able to retain any of the beneficial properties that other bamboo fabric has. The most common complaint among the critical reviews is the quality of the craftsmanship in these sheets. People have complained about the stitching being bad or lazy. One even said that the stitching of her bed sheets was very uneven. While the most common complaint was about the stitching of the sheets, most did say that the overall quality was good. They enjoyed how soft the sheets were and how easy it was to care for them. Alternatively, if you have OCD, these sheets may annoy you to death. The quality of a stitch does say a lot about the skill of the workers who manufactured these sheets. However, these reviews could also be isolated incidents and not the average norm. Really, the only way to find out is to test them out yourself. Unfortunately, there is no mention of a warranty or a money back guarantee, so it is up to you to decide if these are worth the risk. Overall, these seem like quality sheets. While the craftsmanship may be quirky with weird stitching, they are super soft and easy to care for. Not to mention that they will probably fit over any mattress size. If you want to try them out for yourself, you can grab a queen set on Amazon for $84.99. For any other information, including the best bamboo sheets, our Cosy House bamboo sheets review, and our Zen bamboo sheets review, head on back to Green and Growing. Here are some top questions that I found for people seriously considering buying the Royal Hotel Bamboo Sheets. Do these shrink over time? Possibly after a year, but it does not seem to be all that much. Is there elastic along the edges or just the corners? There is elastic that goes the whole edge of the fitted sheet. Are these sheets breathable? Yes, they are far more comfortable than cotton.